A new body mod may be on the horizon. Jason CrazyDragn and I have decided to attempt to re-create the look of the Pontiac GTO nose from the '68-69 year cars for a Fiero. Terry 85SEnochie helped to put my idea into visual form on his Photoshop thread. He did several pics for me and these are my two favorites. There has been a little bit of interest from several forum members who would like for this nose to be produced and made available. That may be far in the future but we at least are at a beginning. Wish us luck and advice is welcome! We are not fiberglass experts so we'll take all the help we can get! I have had this thought myself before. I like it. This looks Pontiac! 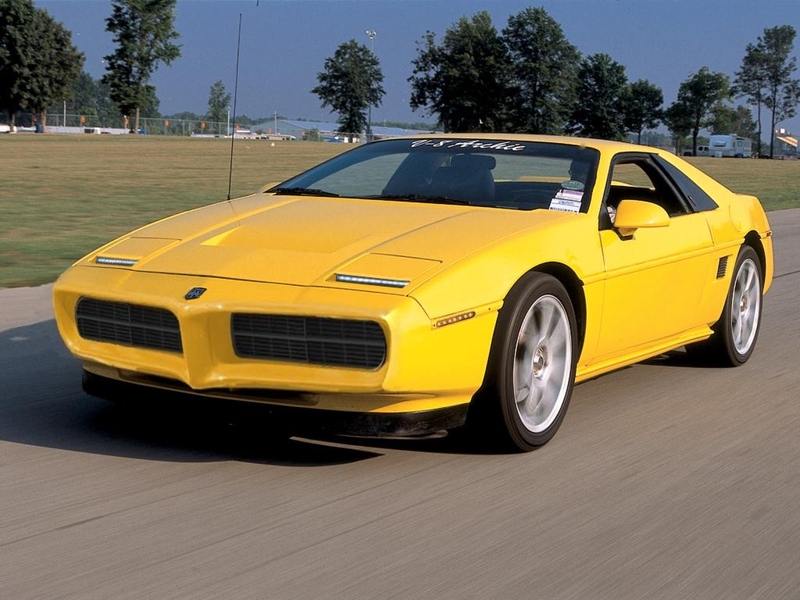 I don''t care for the Fiero nose badge. An Pontiac arrow head from a G6 would go perfect there. This one is on my 88 coupe. I have asked him to Photoshop me a white one on my white 88 coupe. Can we see the rest of the pics please. Ok for a three time 68-69 GTO owner lets just say I WANT IT. Those pics are the only non-stock front ends that I absolutely love. I think that nose will look awesome on a non-aero notchback. An older Camaro style rear spoiler and classic GTO style tail lamps would round out the look. Throw in some 5-star mags, or torque-thrust wheels, and it would be perfect. See guys I told you if you start it you would have no trouble selling these. i just cant wait till you have a few made. 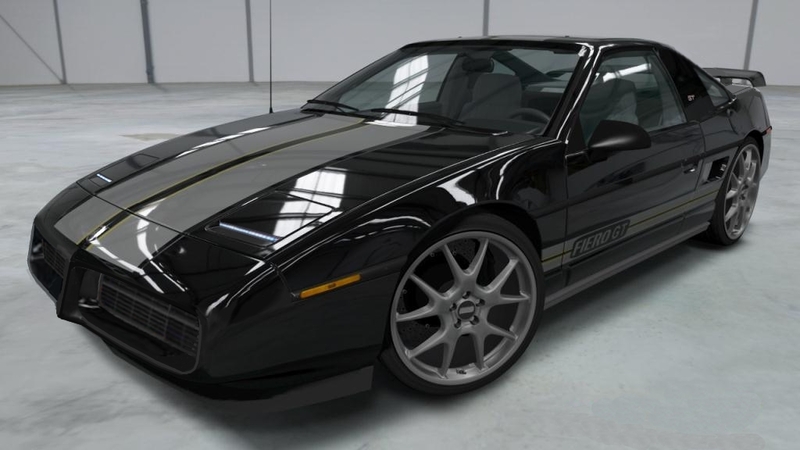 actually looks Better on the fiero than it did on the GTO ! That was a render, WE ARE DOING THE REAL THING! Our plans currently are to see what our own hands can produce. Thats the Idea we are going with at the moment, however we are toying with a few ideas. one idea is to have innerchangable front grills and offer a few different styles. again we are just in the beginning and we are looking for others thoughts before we get to the 'vents'. We can make blank vents till we are sure. anyways here is to everyone who wants to know what we are doing: We (BoostDreamer and I) will post pics periodically. We are thinking of having the blinker behind the vents so that the turn signal can still be seen when on, but out of sight when not on. I voted for this "chin forward" design and CrazyDragn preferred the "forhead forward" look as seen on the yellow notchie. Everyone, let us know which way you like best! Is it one way or no way or would either be fine? It's going to be what you guys want as a whole, so let us here your voices and that is what we are going to do. Boost, did you get my renders of the removable font grill designs? 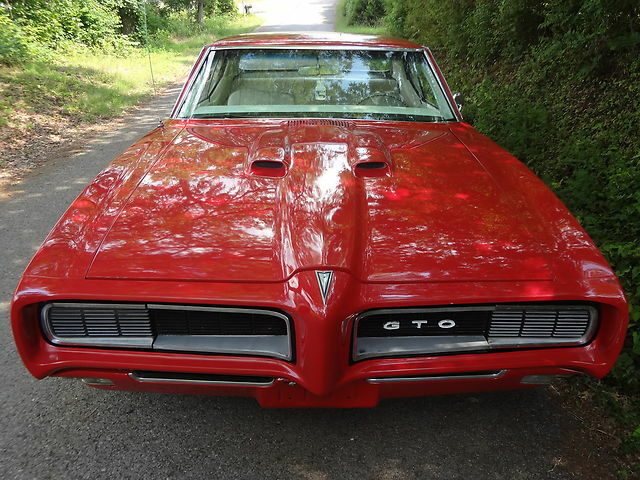 my vote is now and has been ever since the first day i started pestering you guys to make it is the gto!!!!!!!! how long do you guys think it will take to get this product out to us eager patrons? 6 months? 10 months? a year? Our big discussion now is how will we do the insides of the two big cut-outs. The GTO had horizontal lines that I'm not crazy about. We kicked around the idea of louvers like the Barracuda. 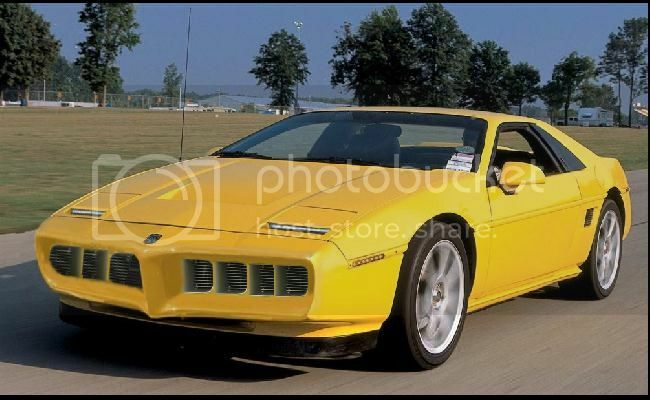 We also thought of having the passenger side having FIERO GTO script and then make a blank space to the far right of the driver's side for mounting either a Fiero nose badge or a Pontiac Arrowhead, etc. We'll get to work on photoshops of this idea. Open for a Solstice style grill. TXGOOD here on PFF found a place on the net that sells the same metal material. Let folks put what they want in there. We actually talked about different styles of honeycomb grills! I think the hexagons from the Solstice would be too large for this application but those like the 65 Mustang would work nicely. We have also talked about just making the grills open and offering different options for inserts. Obviously we are more in the planning stage than production but we did work on the car yesterday. As CrazyDragn has shown, we did take the fascia and eggcrate off my Formula. We also bought a 4'x8'x2" piece of pink insulation foam board. We cut that up and attached it to the front of the car. We decided we were not satisfied with our starting point so we're pulling it all off and buying the two-part foam mix. We'll get all the pink foam off and make a cardboard enclosure to pour the mixed foam into. Once it is dry, we'll start carving. Of course I like the Judge, I prefer the empty look of those two big wide grills! Without the headlights showing, it gives the car a very wide look which makes it look very aggressive. The pics I posted are the final versions of the photoshops. They combine the elements of the previous ones. Both the yellow and black cars have the nose mod, each a little different, but they also both have the LED headlight door mod. The black fastback shows a "shorty" style fastback where it only extends halfway to the rear of the car. The black car is what I want my personal car to look like, paint scheme, body mods, and all. I am keeping an eye on this. I really like the bumper, but She Who Must Be Obeyed thinks it should remain a bumperpad. My photoshop was done in an attempt to convince her...and we decided to put off further discussion until we are prepping for paint. 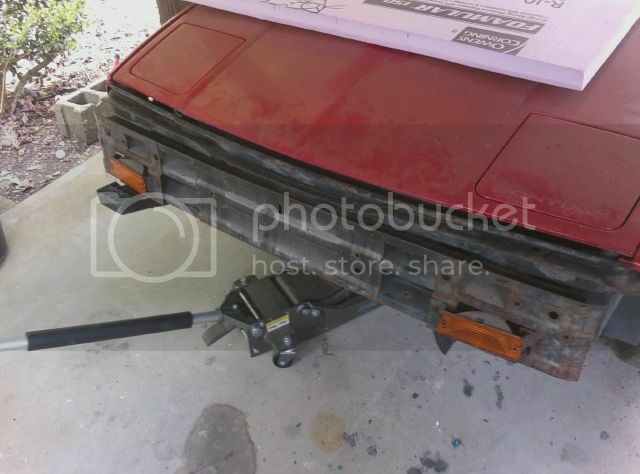 So...if this is not ready for purchase before the car is ready for paint, then I will lose. The horizontal lines are critical to me...it is one of the things that screams "PONTIAC". Of course, that also means I vote against the Barracuda style louvers. I think it would be far easier to add that lettering on an individual basis than to remove it. 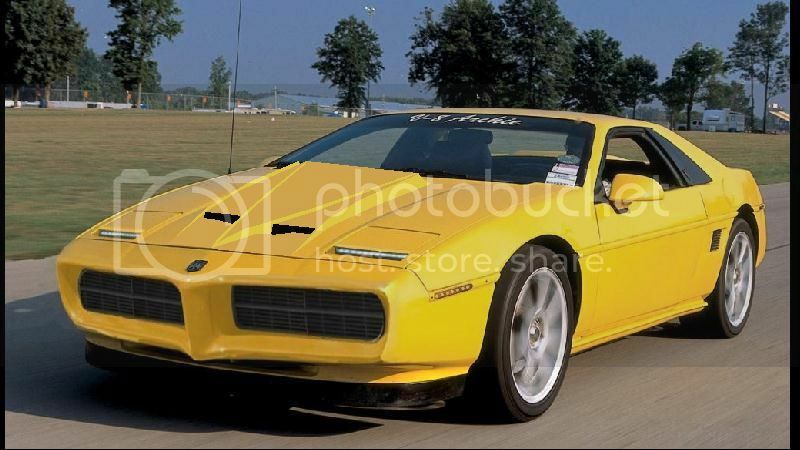 Being forced to buy one that has the "FIERO GTO" lettering in it would be a huge strike against it for me. As long as it is a completely separate part like the photoshop so that we could choose whether or not we want it on an individual basis, then I always support more choices in hood vents...but I think the bumper should be the primary concern (as you can probably tell, I don't care for the hood scoop). Something that hasn't been mentioned....and is missing in all the photoshops (except mine)...I think it needs to be made to accept the front arrow shaped molding of the aero front bumpers. Again, it is easier to smooth that part out than to add it in...and I assume most people would want it. One other point....I thought Jimmy S (FieroFiberglass) mentioned that they were working on one of these...you may want to verify whether or not you have competition before you put too much work into it. Of course, I would love to have the difficult decision of deciding who's I like better. Just my opinion....it is worth about what you paid for it. Naturally, I want my car to look just like my photoshop. We cannot guarantee completion of this project much less a time frame. I can't advise you to wait for it. Yes the yellow one is shorter and that will be how we will do it. The black one is shown too long. I didn't see a need to ask Terry to shorten it. It gave me the needed visual aid. We are leaning toward having the lower part extend out further as a nod to another Pontiac, the Firebird from the 70's. I also think that this design will aid down force and add stability at higher speeds. The last thing our cars need is something that will lift the nose further. We are leaving the front corrugated metal crash bar on the front and sculpting over it. It will remain in tact and be covered. The eggcrate will not be re-used. Maybe we can find a way to add some eggcrate-like strengthening supports inside the casting. The grills can be done so many different ways that we might make them interchangeable and replaceable. That way you can have yours, your way. It will also mean that yours isn't like everybody else's. The hood scoop section will ABSOLUTELY be a separate piece. We hope it will be desireable by itself or with the GTO nose. We have already discussed the ends of the marker lights will be pointed and molded in just like on the GT Aero bumpers. It was supposed to be like that in the photoshops but there again, at the time, there was no need to make Terry do extra work for small details. I have no knowledge of ANYONE working on a similar project. It is a free country and I don't own the design. I can't fault anyone for giving it a shot. In fact, I tried to get others to make it but no one ever showed interest. I appreciate the interest and the details that you're concerned about! Keep the comments coming! Obviously, if this becomes a marketable product, we want it to be the best it can be! I had no intentions of waiting. If we get to the point of bodywork and I can't buy this bumper, then my choice will be either to make it myself or stay with the bumperpad. Sounds great....my issue with the black one was the length, not the angle. If I could choose, I still think I would go with the yellow one....but I would still buy a shorter black one (I would not have purchased the long black one). If I can't purchase the grills the way I want them, that simply means I have to make my own...doesn't change the value of the fiberglass parts. Even if you made them with the Barracuda style...it would still be easier for me to modify it to the way I want than to start from scratch. Sounds like the project is moving in a direction that would make me happy. I was actually planning to make one myself when I got to the bodywork stage of the convertible...and it would have been a shame not to make a mold. This keeps getting referred to as a GTO bumper....but it actually resembles the 67-68 Firebird much more. 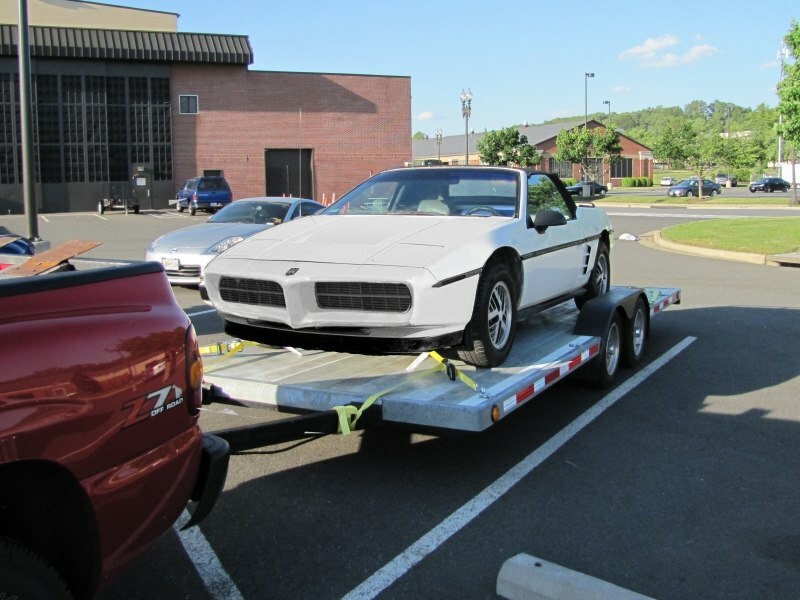 I have been keeping my eye out for a 67-68 Firebird bumper that I could take measurements from for verification...but it looked to me like I would be able to simply cut the front off the Formula style nose, blend the actual Firebird bumper into it, then use that for the plug (wouldn't trust blending the urethane and metal for actual use on the car....guaranteed to crack). We were also talking about the option of putting the turn signal light behind the grills in the corners next to the fenders. therefor they would only be seen when flashing. As far as I know as well JimmyS is NOT working on these. I will call him monday to confirm though. Wouldn't matter anyways because we first started this for BoostDreamers personal car, we will just simply make a mold from that. Keep up the ideas / opinions so we can make something that you would buy too. I'm keeping an eye on this... potential customer here. Like the Black "Chin forward".